Beth is the clinic manager of the Women’s Health and Wellness Center. 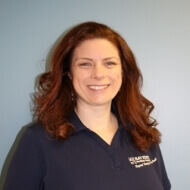 She graduated from Simmons College with a Master’s of Science in Physical Therapy in 2001. While attending school she worked in OB/GYN at Beth Israel Deaconess Medical Center. With seventeen years of experience and extensive post-graduate training, Beth specializes in the treatment of pelvic health in women. This includes, but is not limited to, pregnancy, post-partum, pelvic pain, IC, trauma, incontinence, prolapse, scar-tissue adhesions, abdominal pain, and GI dysfunction. Beth lives in Plymouth with her husband and two children. In her spare time, She enjoys running, baking, and spending time with family and friends.